Is this footage of Bernie Sanders getting arrested in 1963? According to Kartemquin, though the exact nature of the politician’s participation in the civil rights movement has been disputed, Sanders is widely remembered as a student organizer in the early 1960s. 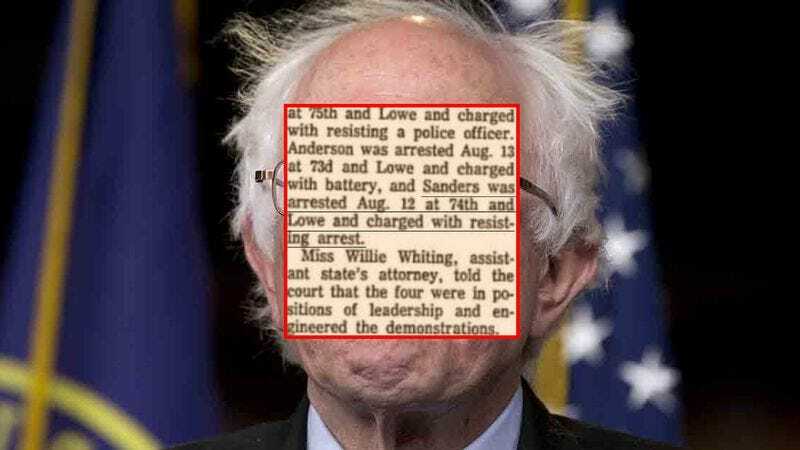 An extant Chicago Tribune clipping from 1964 states that, at the age of 21, Sanders was arrested for his role in a protest in the Englewood area of Chicago in the summer of 1963. A dossier of Sanders-related material at Kartemquin’s ’63 Boycott site includes that Tribune article, some vintage black-and-white photographs, and, most intriguingly, what may well be silent footage of Sanders being arrested at a civil rights protest. The flickering images reveal an earnest, dark-haired young man with horn-rimmed glasses scowling as police put him in handcuffs, like a young Rick Moranis gone political. Witness the alleged Bernie busting below.